Determining the cost-per-win for NHL teams can only be done in hindsight. When building a roster, executives don’t say we want to pay “this amount” for a win or “this amount” for a point. Franchises ultimately want to pay players as little as possible, win as many games as possible, and accumulate as many points as possible. If that’s the case then why create this list? There’s value in learning how much teams are spending and there’s entertainment in learning how poorly they’re spending in relation to wins, points, and goals. What team has the lowest cost-per-win? The answer is the Toronto Maple Leafs. Each of their wins cost over $1.2 million. Toronto was also tops in cost-per-point at a little over $506,000. They were also number one in cost-per-goal at $191,000 and change. The highest amount spent for wins, points, and goals belongs to the Colorado Avalanche. They spent around $3 million per win, $1.4 million per point, and $421,000 per goal. Every NHL team spent more than $1.2 million per win, more than $500,00 per point, and except for the Maple Leafs, more than $222,000 per goal. In the NHL, teams receive two points for a win and one point for losing in overtime or in a shootout. The NHL regular season is 82 games. The Toronto Maple Leafs won 40 games, amassed 95 points, and scored 251 times. They’re playing the Washington Capitals in the opening round of the 2017 Stanley Cup Playoffs. The Pittsburgh Penguins spend wisely. Of course, it helps when you win 50 games. If the Pens win the Stanley Cup again, then all their combined victories, including the 16 postseason triumphs needed to win a championship, will have cost $948,948.82. If the Columbus Blue Jackets skate to a title, they will join the Leafs and Peguins as the only teams to a have a cost-per-win under a $1 million. The Jackets’ cost-per-win after a championship will be $954,483.70. The Tampa Bay Lightning are the first team on our list that didn’t make the playoffs. Part of the reason they’re fourth is their total cap is $55,570,477. The league’s best regular season team has the tenth highest total cap at $73,058,661. They come in at number five because they have a league-best 55 wins. 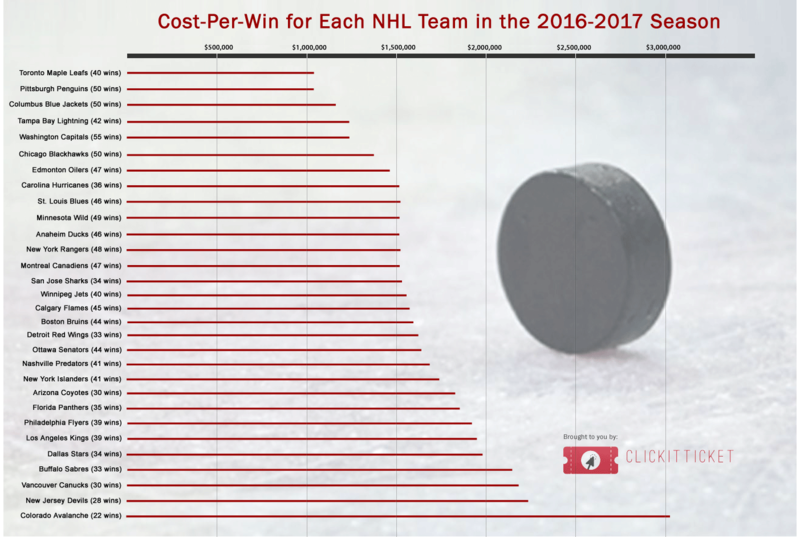 The Chicago Blackhawks are the first team on our list to hold different positions on the cost-per-win list and the cost-per-point list (7th). They’re 13th on the cost-per-goal list. We know it doesn’t work this way, but for a little over $3 million you can buy the Edmonton Oilers a 1-0 victory. The Carolina Hurricanes are sixth on the list of cost-per-point thanks to 15 OTLs. They’re fifth on the list of cost-per-goal thanks to finding the back of the next 215 times. If the St Louis Blues win the Stanley Cup, which means 16 more Ws, their cost-per-win lowers to $1,124,908.35. They’re 15th in cost-per-goal. The Minnesota Wild are also tenth on the cost-per-point list and the cost-per-goal list. They have the sixth highest total cap in the league. The Anaheim Ducks’ cost-per-point is good enough for 8th place. They are 20th in cost-per-goal. For a team from the Big Apple, half a million dollars for a victory isn’t bad. If they attain the Stanley Cup, wins will have cost them around $1.1 million. The Canadiens spend $27,134,106 on defensemen. That’s the second highest total in the league. The Calgary Flames spend about $800,000 more on blue liners. The San Jose Sharks, who have the seventh highest total cap in the NHL, are the last team with a cost-per-win below $1.6 million. The Winnipeg Jets are sixth in cost-per-goal. At $64,113,622, they have the 22nd highest cap total. While we’re on the number “22,” the Calgary Flames have the 22nd highest cost-per-point total. They finished the season with 94 points. If the Bruins go on to hoist the cup, their cost-per-win will decrease to $1,220,931.32. Only two teams, the Nashville Predators and Ottawa Senators, can win Lord Stanley’s chalice with a larger number. For the first time since 1990 the Detroit Red Wings won’t be in the Stanley Cup Playoffs. Despite that, their cost-per-goal is pretty good. They’re seventh on that list. It will cost the Ottawa Senators a measly $1,251,640.88 per victory if they end their season as champions. It has the potential to be the highest cost-per-win total of any playoff team. The Nashville Predators are playing the best team in the west, the Chicago Blackhawks, in the opening round of the Stanley Cup Playoffs. Yet, it’s cost the Predators $316,000 more per regular season win. The New York Islanders are the last team on our list with more than 40 wins. They’re 18th in cost-per-point and 16th in cost-per-goal. No team in the NHL spends less on forwards than the Arizona Coyotes. Their cap hit of 14.6 million is nearly $4 million less than then next lowest team (Tampa Bay Lightning). The Florida Panthers total cap isn’t that high, just $64 million, but they just didn’t win, collect points, or score very much. No team spent as much as the Philadelphia Flyers did on forwards. How much did they allocate to their front line? How about $45,137,569. At $75,503,203, the Los Angeles Kings boast the highest total cap for the 2016-2017 season. Their cost-per-goal is second-to-the-last. The Dallas Stars are the last team to have a cost-per-win under $2 million and the first team to have a cost-per-goal over $300,000. Every one of the Buffalo Sabres’ wins equals a small fortune. Not very efficient, especially when you consider that the Sabres had the 11th highest total cap ($72,429,490). The Vancouver Canucks’ cost-per-point was the second highest in the NHL. Their cost-per-goal was third highest. And they had the third fewest wins. If the New Jersey Devils were at the salary cap max their cost-per-win would increase to over $2.6 million. What an abysmal season. The Colorado Avalanche won just 22 games. Their cost-per-point is higher than six teams’ cost-per-win. Their cost-per-goal is $45,000 more than the next closest team. NOTE: All cap numbers were provided by Spotrac’s NHL Team Salary Cap Tracker and are accurate as of 4-10-2017. All cap numbers are subject to change.